Since it entered the ACC last season, Notre Dame has faced some of the toughest competition in the nation. This weekend, the team will welcome a perennial national contender in No. 14 Virginia, which will enter Frank Eck Stadium fresh off a College World Series finals appearance last season. The Cavaliers (15-8, 3-6 ACC), which fell to Vanderbilt in the best-of-three College World Series finals last June, have struggled recently, losing seven of their last 10 games. Nonetheless, Notre Dame head coach Mik Aoki said he expects Virginia to present a tough challenge for the Irish (16-7, 3-6). “I know that they’re a really good club,” he said of the Cavaliers. “I know that they’re going to pitch their rear ends off, and we’re going to have to do a great job of competing from pitch to pitch in order to get the results we want to come out with. Irish sophomore catcher Ryan Lidge prepares to swing at a pitch during Notre Dame’s 6-4 loss against Louisville on Saturday at Frank Eck Stadium. Lidge finished 1-for-5 at the plate. Aoki said Virginia has typically been strong in multiple facets of the game under head coach Brian O’Connor, an assistant coach at Notre Dame from 1995 to 2003. Since O’Connor arrived at Virginia in 2003, the Cavaliers have made 11 NCAA tournament appearances and reached three College World Series. Virginia sophomore catcher Matt Thaiss has led the Cavaliers at the plate, posting a .345 batting average and seven home runs on the season. Virginia junior right-hander Nathan Kirby, named a first team All-American last season by multiple publications, has a 3-1 record with a 1.16 ERA and 54 strikeouts in 38 2/3 innings on the season. Notre Dame will enter this weekend’s series coming off an 8-3 win against Western Michigan on Wednesday night. 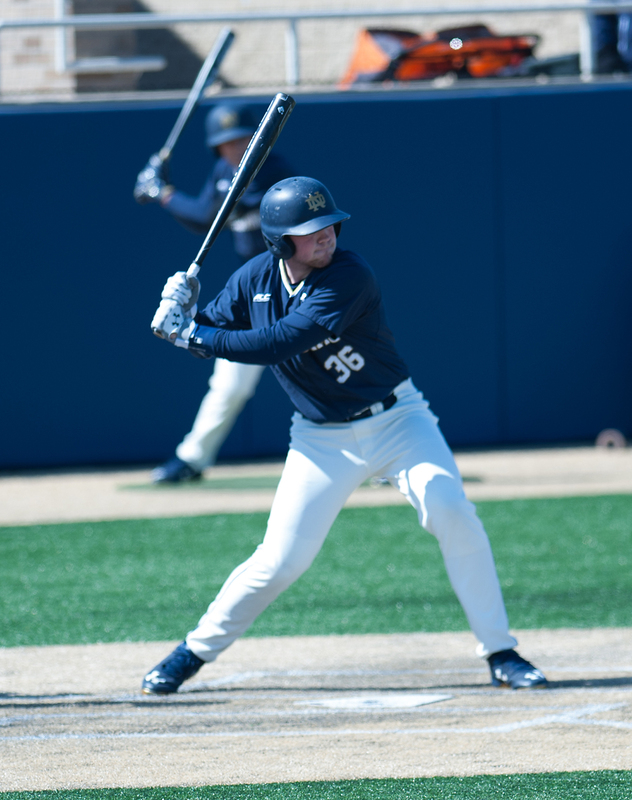 Irish sophomore catcher Ryan Lidge was 4-for-4 with three runs scored, two doubles and an RBI against the Broncos, and Irish sophomore right-hander Ryan Smoyer picked up his second consecutive win while allowing two runs on six hits in 5 1/3 innings. The Irish hosted their first home conference series last weekend, scoring only four runs in three consecutive losses to No. 7 Louisville. Despite the team’s struggles last weekend, Aoki said he is not worried about Notre Dame’s ability to play at a high level and maintain focus over a three-game series. Notre Dame’s usual weekend starting pitching trio of senior right-hander Scott Kerrigan, freshman right-hander Brandon Bielak and junior right-hander Nick McCarty have provided strong efforts on the mound all year, Aoki said, which he expects to continue this weekend. Notre Dame and Virginia will meet in a doubleheader beginning at 1:05 p.m. Saturday. The Irish and Cavaliers will conclude the series Sunday at 1:05 p.m. All games will be at Frank Eck Stadium.